The Bishop Stuart University main campus. In set is Solomon Atwebembire, the guild Presidential aspirant. 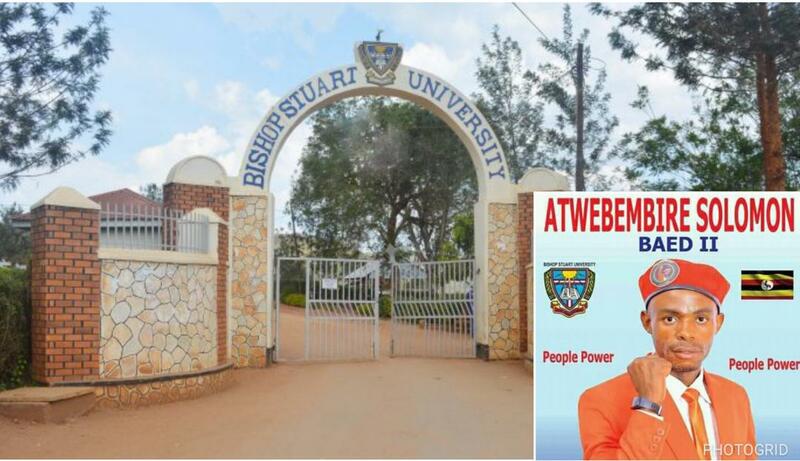 Bishop Stuart University (BSU) in Mbarara has come out to refute claims that a guild Presidential aspirant was blocked by the university management because he subscribes to the ‘People Power’ political group. ‘People Power’ is a political pressure group that became popular last year and is championed by Kyadondo East MP also Presidential hopeful, Robert Kyagulanyi (Bobi Wine). There have been reports in the media alleging that the BSU administration blocked a student identified as Solomon Atwebembire from registering to take part in the guild race. According to Deusdedit Bwengye, the lawyer representing Atwebembeire, the student was denied the requisite signatures from all the relevant university authorities including the university chaplain. Later, Atwebembire opened a filed in court on the advice of Bwengye and also took the matter before the Equal Opportunities Commission. The Commission wrote to university authorities ordering them to postpone or withdraw the disciplinary proceedings against Atwebembire which were scheduled for Monday (yesterday) at 3pm as summoned by the university vice chancellor Prof. Mauda Kamatenesi. Mpitsi Pac Lawrence Mujuni, the Secretary to the Commission further directed the university top leadership to sign Atwebembire’s clearance forms such that he is nominated on the same day and time as the other aspirants. “Sign for him on his clearance forms such that he is nominated on the same day and time as the other aspirants” reads part of the letter by the Commission. However, when contacted by SoftPower News, the university PRO, Rose Rwankore instead said that the candidate in question had not met the requirements since his academic results had issues. “Atwebembire sat for a paper but intentionally registered with a wrong serial number and registration number. Results came out but were showing a different person who does not even belong to BSU,” she said. She added that a university cannot clear any candidate who does not have results and hasn’t paid tuition fees to zero balance. “When he was caught up by time, that’s when he went to the head of department claiming he didn’t have results. They followed up the matter and found out that he had the results but with wrong registration number”. Rwankore said that the policy is such that no candidate can be cleared if they don’t have results. She confirmed that Atwebembire apologized on behalf of the University for the mistake he did in paper and wrote an apology requesting for his results in order to register. “When we called him, he admitted that the paper is his and he apologized for the mistake, he wrote an apology and attached it requesting for his results”. Rwankore claims that Atwebembire is being misled by some elements at the university to report matters to the media and Equal Opportunities Commission. “He deceived people that he was chased from class because he supports ‘People Power’. So, he ran to the Commission. The problem is with the boy,” said Rwankore. The university has asked Atwebembire to withdraw the court court and clear on air the media reports. “When the university learnt that its Atwebembire’s mistake, we asked him to withdraw the case and the allegations he had made in the media. If not, he will face the disciplinary committee. If it is you that made a mistake, why then rush to the Commission? He used his mistake to tell lies that the university blocked him from standing because he subscribes to ‘People Power’”. 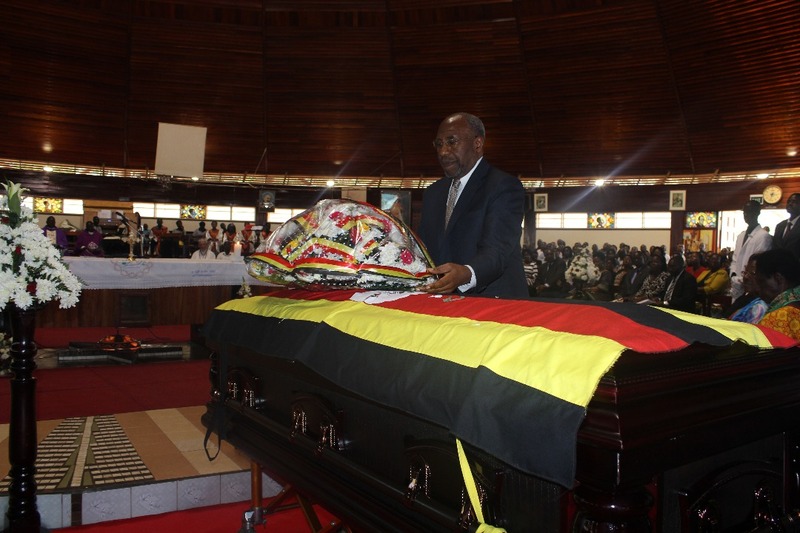 However, Atwebembire told SoftPower News on phone that he is not willing to apologize neither is he ready to retract his statements made to the media concerning the mater. According to the University PRO, a disciplinary meeting had been convened on Monday to handle the issue but Atwebembire snubbed it. “Yesterday, the disciplinary committee sat and invited him but he refused to attend. It (meeting) ended late in the evening. I don’t know what came out of it”. Atwebembire’s lawyer said it is the Equal Opportunities Commission that directed his client not to attend the disciplinary meeting. 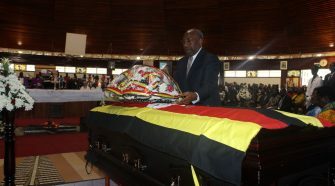 “There was no need for Atwebembire to attend the meeting when the Commission had ruled. If the university is not aware, they should seek clarification,” said Bwengye. Six candidates are intending to join the Bishop Stuart University guild race with nominations scheduled for (today) Tuesday April 16 and polls due on April 27.